Tisca: From VJ’ing to cooking. How did the change in careers happen? Maria: Out of desperation! It began with cooking for my son Zeke and I started out with stuff like French toast. I took him out once to an Italian place and he loved the risotto. So, risotto was actually the first dish I learnt how to make. After some time I started enjoying cooking, and that’s how it all started. Maria: I realised that I’m not really qualified in anything in life. You don’t go to a school to be a VJ or to be able to talk on television. I really wanted at least one degree besides my graduation. So, I went off to Tante Marie in 2011, and I did my Cordon Bleu certificate course there. The reason I could do it was because Arshad stayed home for three months and looked after Zeke and Zene, who were pretty young at that time. It was the most amazing experience in my life. My mind opened to everything concerning food and life. It was the first time I lived on my own. I’ve never even lived alone in a room, so it was pretty scary also! I realised that when you love something so much that you actually go and learn it you are able to do just about anything after that, and I mean anything in life. Maria and Arshad’s daughter Zene read out of Maria’s new book in a neat Harry Potter accent! Tisca: In the process of cooking, there are some sixes and fours but there’s also the odd run out. Tell us about the things that didn’t work out. 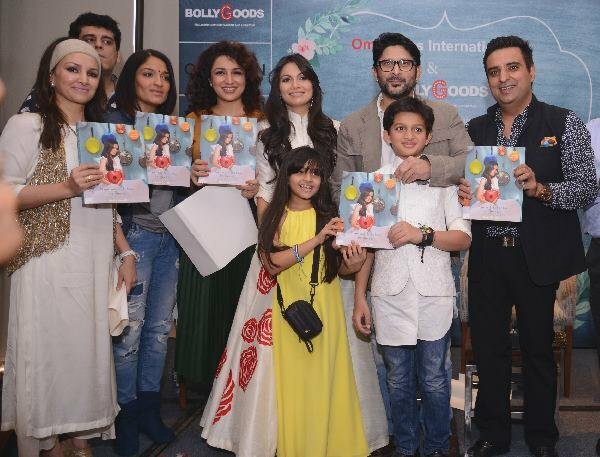 Maria: Many years ago I was on this food show and when I came back Arshad was shooting on the terrace with Amit Ashar (who also shot for this book) for some film publicity. I decided to make this new dish I’d learnt and so I really worked hard the whole morning and I made braised cottage cheese with spinach. And I remember Amit came to the table, looked at me, and said ‘Palak Paneer! You made Palak Paneer!’ I felt so stupid. I didn’t even know what Palak Paneer was till then! Tisca: Ajay, how did the idea of getting Maria to write this book come about? The way Maria works is that when she travels she picks recipes, which she then makes at home and serves to friends. Tisca: I remember we had tried yak cheese in Bhutan and Maria was like ‘Oh! I love this! It’s Yak cheese!’ For Maria every new taste is a moment of revelation. It’s another planet found! It’s another galaxy discovered! Maria, your book is in an interesting monthly format. Why did you choose this method? Maria: I didn’t choose the format. It was desperation. Since I’m not a chef and I’m not a writer, I did not know how to start this book. When Mago asked me to do the book I figured I have to churn out something. I did not know how to put a menu together because I don’t have a restaurant. Ajay: It took us one year to start! Maria: I’d thought you were just having polite conversation while we were driving up to Tiger’s Nest! I thought you were only being nice and saying that we should do a book together! So anyways, I thought I should do a seasonal menu. But by the time I would collect vegetables for the season, the season would get over. Then I just got down to basics. I cook for people that I really love, which is by the way why I don’t have a restaurant. Because I can’t tell people I don’t like, to not come into my restaurant or that I won’t sell you my breads because I don’t like you too much! I decided to divide this book into months and dedicate each month to something or someone I love and make a menu according to that. So that’s how it came about: desperation! 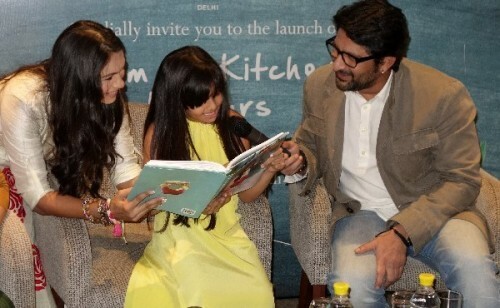 Tisca: Arshad, have you tried any of the dishes from the book? Arshad: All of them. All three of us (Arshad and their two children) eat all the food and we then tell her what we think about it. 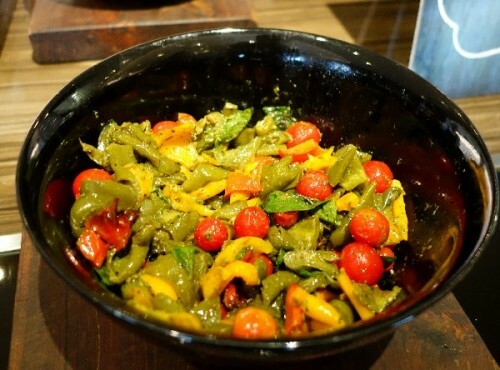 Roast Pepper Salad was among few of her recipes served at the book launch. Arshad: The meringue is my favourite. It’s unbelievable. Meringue is made out of egg whites and sugar. I always tell Maria if you could replace the sugar, then it would be the healthiest and tastiest dessert. It only has egg whites, sugar and some fruits. Then there’s the stuffed chicken that I completely enjoy. That’s just so good. Tisca: What’s your plan from here Maria? Maria: I want this book to sell so much that I can just travel the world for a year! I always have a plan attached to a plan. The plan was not about writing a book. It was about getting to travel. This was the hard work and that will be the holiday. The plan is to travel. That’s always the plan! Maria: I told you I have a problem with people. I can’t do restaurants. I don’t know how to be a good businesswoman. Tisca: Ajay, plans for the book? Ajay: We have plans for the whole year. Good news is that we already have sold the rights for translation in Vietnamese. We will be travelling with the book through literature festivals and through the circuit. Maria has plans for other books as well. I’m forcing her to write more. Maria: About the book: It is just a plain, simple labour of love. It is really simple food that you can make in your kitchen. Ingredients are all that you can get in the market here in India. I have given options like if you don’t want to use the baguette use the kadak pao, which is absolutely fine and yummy. When you make food at home, we cook because we want to serve it to people we really love. This book is all about that. When you do try the recipes in the book please feel free to tweak it and make it your own. That’s the only reality about food that you cook, that you really love to serve. Unless it’s a baking recipe, please follow them exactly how I’ve written it! All the rest, please make them your own because that’s the fun in cooking. 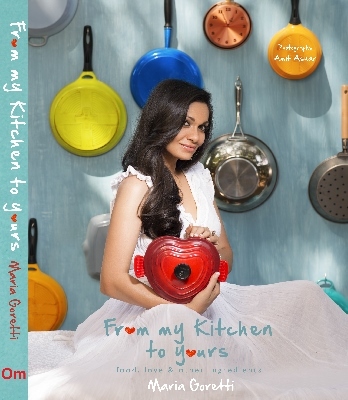 Maria’s book ‘From My Kitchen to Yours’ in now available in the market. You can order it online from Amazon as well. Tagged Food, Food & Drinks, LifeSpice, The Good Life. Bookmark the permalink.